That is a possibility, or the accelerator pump is starting to go. 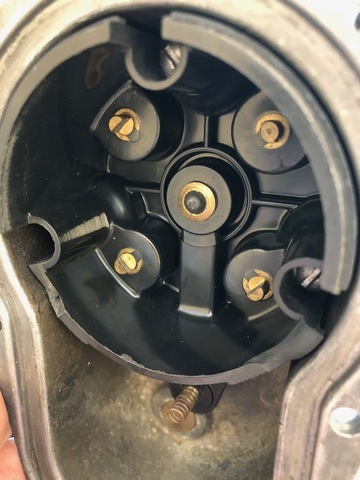 I got the engine to be more regular when I drive although it still has some failure when you are in the process of acceleration between gear and gear.Its look like as small cuts or chokes.I give more rich mixture but remains the same. The idle idle is perfect and when I accelerate if The A2 is stopped it is also perfect (no failures) but driving I have not been able to solve those small mistakes. Finally I preferred to install th small O ring washer and everything has been exactly the same. It seems that everything is going well but it has those small faults / chokes while you are driving. If tomorrow I can make a short video I'll put it in the forum. As I had a new spare coil, a capacitor and time I wanted to do a test and I replaced the originals. Everything is still the same. My A2 still has those little flaws/chokes while yuu are driving. 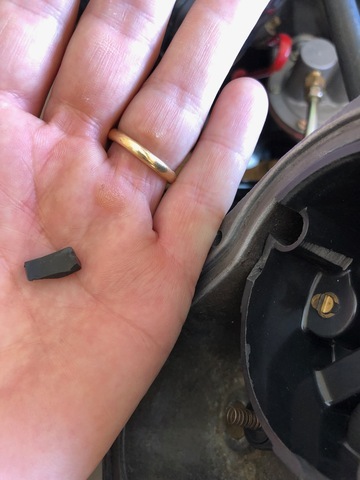 On the order hand ,I saw that the distributor cap has a small break. Can it be important? Is it better to replace the lid with a new one? The piece missing from the cap will not affect the way it runs since it is not near the terminals. The older coil is an original USA made coil, the shiny one is a Chinese made coil. 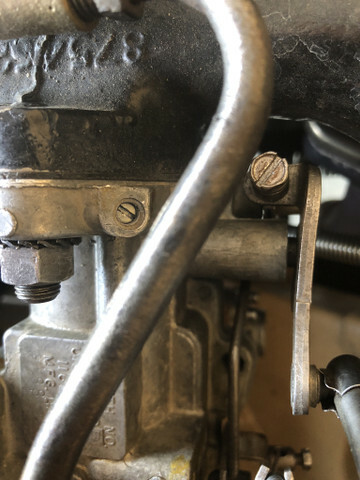 As far as the gasket under the idle jet, as long as the jet makes good contact with the large gasket on top of the bowl that is all that is important. 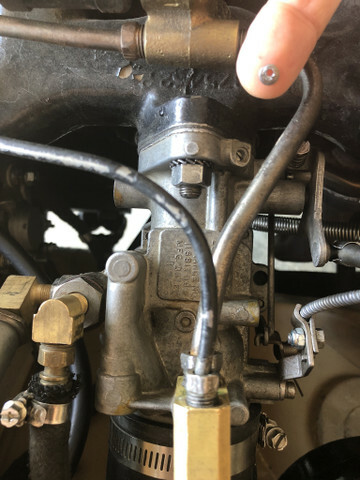 The one under the jet is basically there to hold it against the top gasket and I have found that a lot of newer 13660 A and B carb do not have the gasket nor do they have any ledge in there for it to set on. 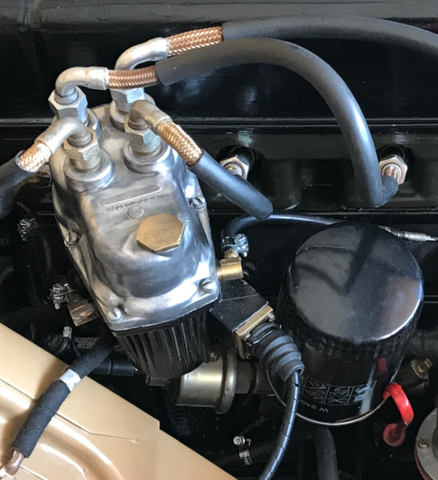 Hi, Finally I was able to solve the problem with my engine. After checking the carburetor, coil, cables, etc ... 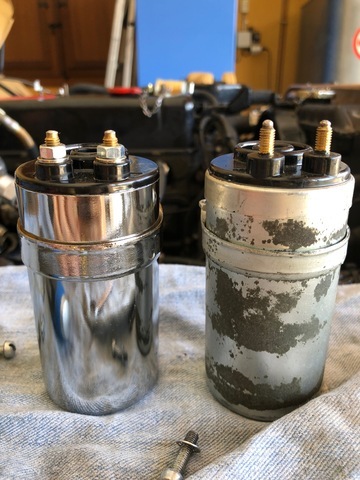 I realized that I could not advance the ignition more than I had it because it touched the oil filter. Your picture of that shaft says "original", Is that how it was when you took it out? If so then someone else already had modified it. Resourceful mechanic, good man to have around. That fix coukd really give any future mechanic fits trying to time the engine by the book. rickf wrote: Your picture of that shaft says "original", Is that how it was when you took it out? If so then someone else already had modified it. Resourceful mechanic, good man to have around. Hi Rick. That piece is the one that takes out. thank you for your observation. I will keep it in mind in case I have to make some repairs in the future. Could you send a photo of the original NOS piece? I don't have one handy and I am trying to get ready for a trip. The slots should be pretty close to inline with each other besides the one being offset to one side a bit. Very clever, but I agree with Fil. The next guy is really gonna be scratching his head. Ah well, ya gotta do what ya gotta do, right? Fil Bonica wrote: That fix coukd really give any future mechanic fits trying to time the engine by the book. what would be the problem. sorry for the question but, I am not very good with very technical repairs but I really like to understand things. If a future mechanic wanted to do the timming with a light ,what would be the problem it would have? 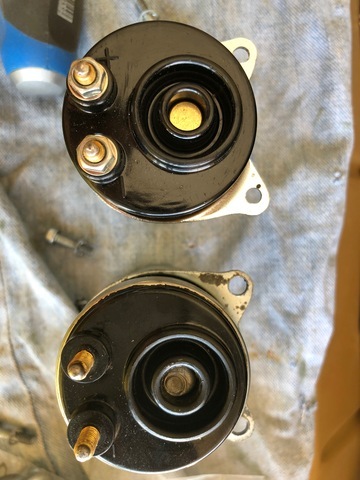 The only time there would be a problem would be if the next person pulled the oil pump and put in a new one and installed it correctly. Then he would run into the same problem you did. 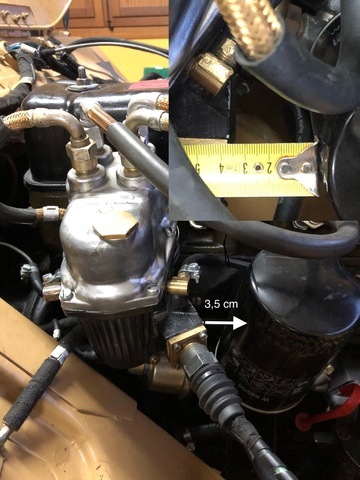 His solution would be simpler though because all he would have to do is get a factory intermediate shaft and pop it in and he would be right back to a stock engine. 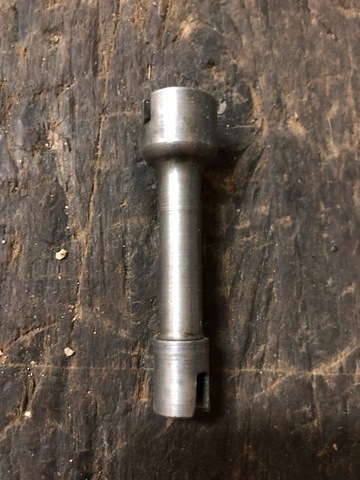 I have several distributors where someone took the dog off of the bottom of the shaft, rotated it, and then drilled a new hole and pinned it back on in a new position. That did exactly the same thing you did Elmer. My first engine was the exact same way. Don't worry about it. You and I had to figure it out as have many others obviously. They will continue to do so. If you ever pull the engine then that is the time to put it all right.